DART (Digital Advanced Radiographic Technique) is a new method for inspection based on a new digital x-ray camera system. The system is optimised for detection, characterisation and sizing of IGSCC-type cracks in piping systems. The digital x-ray camera provides better image quality than what is achievable when using conventional film-based technique and the resulting images can be presented as traditional x-ray images. The system uses a remote controlled manipulator system which scans the volume of interest. It also positions the x-ray source and x-ray camera at different angles relative the crack and create projection images of the crack. By using a tomographic reconstruction of these images a 3-D representation of the crack can be used for analysis and sizing. Fig. 2: X-ray camera placed inside pipe, x-ray tube placed outside pipe. 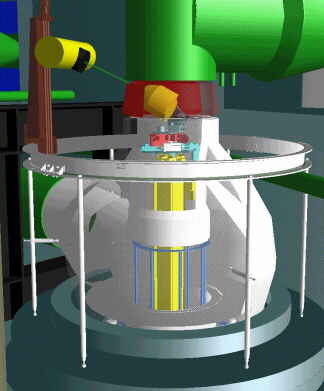 The system layout presented in this paper is the version designed to be used for testing welds in piping systems (313) in Swedish nuclear power plants. The material is stainless steel and the material thickness of the pipes are approximately 60 mm. A remote controlled manipulator carries both the x-ray source and the x-ray camera. An x-ray energy of 450 kV is used produced by a constant potential x-ray machine with a focus size of 1 mm2. The x-ray camera is connected to a computer where the images are collected and processed. This computer is connected to a master-computer through a local network which enables the operator controlling the system to be placed in a room at a great distance from the testing area. The manipulator consist of two parts, an outer part and an inner part. The pipe is x-rayed through single wall with the x-ray camera placed inside the pipe and the x-ray source placed outside the pipe (see figure 2). In this figure the two welds to be tested can be seen. Even though the two parts of the manipulator are mechanically separated from each other the positioning of the manipulator is controlled by using one combined co-ordinate system. This is extremely vital since the tomographic reconstruction demands a synchronised movement with precise positioning when each projection is exposed. In the DART system the conventional x-ray film is replaced with a new type of digital x-ray camera. The object to be tested is a pipe system with rather high background radiation which the camera has to be protected against to reduce noise in the x-ray images. Therefore the camera is designed with protective lead and wolfram layers. The camera can be used in environments having background radiation levels of up to 50 mSv. The camera type is a cooled scientific slow-scan CCD. It has a large CCD-chip with high resolution. The number of pixels on the CCD-chip are 1300 x 1200 with a pixel size of 22.5 x 22.5µm. In front of the camera a scintillating fibre plate is mounted which converts the x-ray radiation into visible light. The light is transferred to the CCD-chip via a fibre-optic light guide with no magnification. By using a lens-less system a very high resolution is achieved. The camera works in a slow-scan mode which means that the x-ray images are not retrieved in real-time. Instead it has exposure times equivalent to the exposure times when using conventional x-ray film. The signal is integrated on the CCD chip during this time and then read out to the computer. The signals are converted from analogue signals to digital signals with 12-bit resolution (4096 grey scales). The image quality of this digital x-ray camera is better than what is possible to achieve by using conventional film-based technique. 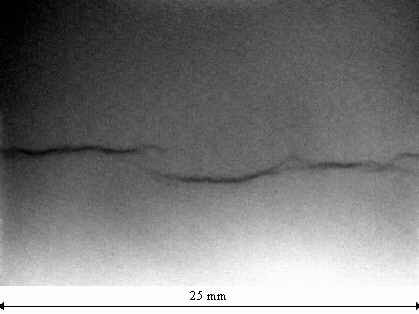 Figure 3 shows a crack (IGSCC-type) in 60 mm material (SS) thickness. The depth of the crack is 7 mm. To detect cracks in the object the manipulator moves the x-ray tube and the x-ray camera in a step-wise scanning pattern covering the area of interest. At each step an x-ray image is retrieved covering an area of the object of about 25 x 25 mm. This scanning procedure is done automatically. If a weld is to be inspected all these single images can be put together in rows creating a large image of the entire weld. Fig. 3: Crack in 60 mm material. When a crack has been detected the manipulator positions the x-ray tube and the x-ray camera at different angles relative the crack creating projection images of the crack. These images are the input data to the tomographic reconstruction. Since there are limitations in the angular interval due to the geometric constrains of the pipe, conventional computer tomography cannot be used. Therefore a method called linear filtered tomosynthesis is used to reconstruct a 3-D representation of the crack. By using this method projection images need only to be taken at an angle range of -15° to +15° around the crack. In figure 3 the manipulator is positioned at an angle of 0° relative the crack and in figure 4 it is positioned at an angle of -15° relative the crack. The depth of the crack can be estimated from analysing the top view shown in figure 5. In this figure the crack's opening is in the lower part of the figure and the crack tip in the upper part of the figure. The measured distance in figure 5, between the opening and the tip, is equal to the depth of the crack. The reconstruction algorithms are run on any standard PC which run at least Windows 95 or Windows NT4. Run-times vary from 5 minutes (Alpha 500MHz Windows NT4) up to 60 minutes (Pentium Pro 200MHz Windows 95) depending on the speed of the computer and the complexity of the reconstruction settings. Reconstruction can be carried out right after collection of data at the test site giving instant measurements of sizing and characterisation of the defect. Another way of using the projections is to view them as an animation. It has been shown that humans interpret moving images very well. The animation is played as a loop mimicking the movement of the manipulator thus creating an appearance of a rotating/swinging crack. Viewing the crack like this, from different angles, gives a good understanding of the crack's morphology and helps the operator determining the type of crack. The DART system has been qualified according to the new regulations for ISI issued by the Swedish Nuclear Power Inspectorate. The DART system presented in this paper will be used for inspection of welds in Swedish nuclear power plants during 1998. Karlströms, M., Magnusson Seger, M., "Crack estimation with linear filtered tomosynthesis", ISSN: 1400-3902, Dept of Electrical Engineering Linköping, Sweden (1998).